The PriestMartyrs Hermolaus, Hermippos and Hermocrates, Clergy of Nicomedia, were among the small number of those remaining alive after the burning of 20,000 Christians of the Nicomedia Church in the year 303 (Comm. 28 December), – done upon the orders of the emperor Maximian (284-305). They hid themselves in remote places and did not cease to teach pagans the Christian faith. 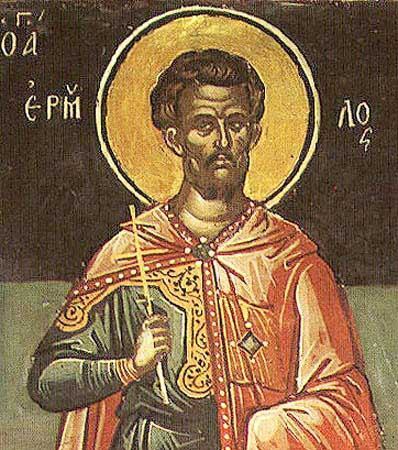 Often there passed by the house, in which Saint Hermolaus had concealed himself, the young pagan named Pantoleon (Holy GreatMartyr Panteleimon, Comm. 27 July). One time Saint Hermolaus chanced upon the youth and asked him to stop by for him at the house. In their conversation Saint Hermolaus began to explain to his guest the falseness, impiety and vanity of worshipping the pagan gods. From that day on Pantoleon began daily to visit Saint Hermolaus and received of him holy Baptism. When the trial of the holy GreatMartyr Panteleimon was being held, Saints Hermolaus, Hermippos and Hermokrates, were also arrested. The Lord Jesus Christ appeared to Saint Hermolaus on an evening and revealed to him, that on the following day he would suffer for Him and receive a martyr's crown. Saints Hermippos and Hermokrates were arrested and brought to trial after Saint Hermolaus. All three were given the chance to abjure from Christ and offer sacrifice to idols. But they resolutely refused, confessed their faith in the Lord Jesus Christ and were prepared gladly to die for Him. The pagans began to threaten the holy priests with torture and death. Suddenly a strong earthquake occurred, and the idols and pagan temple collapsed and shattered. A report was made about this to the emperor. The enraged Maximian gave the holy martyrs over to torture and pronounced upon them a sentence of death. Bravely enduring all the torments, the holy PriestMartyrs Hermolaus, Hermippos and Hermokrates were beheaded in about the year 305.